We’d love your help. Let us know what’s wrong with this preview of Mr Lear by Jenny Uglow. Edward Lear lived a vivid, fascinating, energetic life, but confessed, 'I hardly enjoy any one thing on earth while it is present.' He was a man in a hurry, 'running about on railroads' from London to country estates and boarding steam Acclaimed historian Jenny Uglow brings us a fascinating and beautifully illustrated biography of Edward Lear, full of the colour of the age. To ask other readers questions about Mr Lear, please sign up. I only knew Edward Lear for his nonsense rhymes, which we recited to our children when they were small. They giggled constantly. But it turns out that Lear was an accomplished painter, as well. His subjects were landscapes, birds, and other animals. He traveled extensively in pursuit of his live subjects, although not in the wild but in aviaries and zoos. Lear had many friends, as well as a large social set. He was a popular guest because of his humor and his musical talents. Paradoxically, howe I only knew Edward Lear for his nonsense rhymes, which we recited to our children when they were small. They giggled constantly. But it turns out that Lear was an accomplished painter, as well. His subjects were landscapes, birds, and other animals. He traveled extensively in pursuit of his live subjects, although not in the wild but in aviaries and zoos. Lear had many friends, as well as a large social set. He was a popular guest because of his humor and his musical talents. Paradoxically, however, he was a very lonely man. He was a bit peculiar, even beyond typical Victorian eccentricity, and a tad odd looking. He felt that he would have liked to be married and have children, but had no idea about how to make that happen. The author speculates that Lear may have been gay, although there was no direct evidence. I had this sense while reading this book that I already knew people like Lear. Instead of being withdrawn or isolationist, they are invariably bon vivant and outgoing, although very guarded about their inner feelings. And like Lear, they are obsessive and throw themselves full tilt into their work or some special interest. I get the distinct impression they are trying to outrun loneliness. I just finished reading “Mr. Lear: A Life of Art and Nonsense”. It is a beautiful book that has lavish illustrations and quotations. This book would make a great holiday gift. Edward Lear (1812-1888) is best known for his nonsense rhymes, written primarily for children but with an appeal across all ages. Some of his better-known works are: “The Owl and the Pussycat”, “A Was Once an Apple Pie”. Lear was a seeker and taxonomist, observing and recording plants and foreign vistas as he travelled widel I just finished reading “Mr. Lear: A Life of Art and Nonsense”. It is a beautiful book that has lavish illustrations and quotations. This book would make a great holiday gift. Lear was a seeker and taxonomist, observing and recording plants and foreign vistas as he travelled widely across Europe, the Middle East and India. Lear specialized in bird illustrations and worked at the new Zoological Society of London. He produced his first illustrated book on parrots early in his career. Lear suffered from asthma, bronchitis and epilepsy which restricted his life to some extent. The book is well written and meticulously researched. Jenny Uglow does a good job reconciling his two vocations and weaves them seamlessly together. Uglow also provides information about lithography and artistic technique. The author also provides background material about the political atmosphere in Italy in the years around unification when Lear’s outdoor sketching was often regarded as a front for spying. I thoroughly enjoyed this book and learned so much about Lear and the Victorian Age. I read as a hard-cover book. The book has 608 pages. The publisher is Faber and Faber. Hope my earlier notes will be saved as private, but I am at a loss when I don't have highlighting available with kindle format. I borrowed this book from my library. It is a beautiful $45 book, and if one admires Edward Lear, it would be a great reference book to own. The writer does a very thorough and excellent job without including negative viewpoints of Lear's work. It is a happy/sad but thoroughly detailed account of Edward's young life through to the end. A restless and complex man, he liv Hope my earlier notes will be saved as private, but I am at a loss when I don't have highlighting available with kindle format. I borrowed this book from my library. It is a beautiful $45 book, and if one admires Edward Lear, it would be a great reference book to own. The writer does a very thorough and excellent job without including negative viewpoints of Lear's work. It is a happy/sad but thoroughly detailed account of Edward's young life through to the end. A restless and complex man, he lived in many places and had many famous friends. This book also serves as a great reference for life as lived in the 1800's. Edward Lear was artistically talented in his drawing skills, musical skills and writing skills. He was, however, also plagued with ill health due to epilepsy and asthma along with depression, but that did not stop him from having truly grand and brave singular adventures. Inspirational! make you laugh. The life story will make you cry - and applaud. Adam Gopnik's wonderful review-essay at the New Yorker. Check out the opening illo: Lear & his cat! "We find, in Lear, the immersive, overstuffed feel common to all Victoriana—and here is Victoria herself, getting a drawing lesson from him. Because Lear was lodged far more securely in Victorian society than the donnish Carroll was, his art mirrors and parodies it more precisely. Carroll was making jokes about Oxford; Lear about London and the world." Re: Adam Gopnik's wonderful review-essay at the New Yorker. Check out the opening illo: Lear & his cat! It is significant that the luminous nose of the Dong is not biological, like Rudolph’s. It is hand-tooled, like a steampunk machine ... —an up-to-date device, like an iPhone flashlight, for finding Jumbly Girls in the dark." Not even Humpty Dumpty could explain what a runcible spoon is. We know it by its verbal vibration, by its presence, by its sheer runcibleness." Most of us know Edward Lear as the writer of nonsense verse. “The Owl and the Pussycat” is the first poem I ever learned by heart and even though I learned a few more in years closer to now than then I still remember more of it than I do of any of the others. But in his lifetime Lear was known for other things first. As a teenager and young man he became England’s Audubon, doing brilliant paintings of birds and other wildlife for zoos and wealthy patrons with private zoos and from stuffed exotic Most of us know Edward Lear as the writer of nonsense verse. “The Owl and the Pussycat” is the first poem I ever learned by heart and even though I learned a few more in years closer to now than then I still remember more of it than I do of any of the others. But in his lifetime Lear was known for other things first. As a teenager and young man he became England’s Audubon, doing brilliant paintings of birds and other wildlife for zoos and wealthy patrons with private zoos and from stuffed exotic animals. He published several successful books of these illustrations. He became a landscape artist and world traveler (Italy, Greece, Corfu, Albania, Turkey, Egypt, Palestine, India, Ceylon), publishing travel books illustrated with prints from his sketches, watercolors, and oil paintings. Since his travels were underwritten by subscriptions from landowning friends of the upper classes, he was a frequent guest at their estates and as a talented musician (piano and guitar) he was quick to entertain both adults and children with popular songs, spoofs of popular songs, and original songs. He was also was given to puns and word play and would entertain the children of the house with illustrated alphabets and limericks (a form that existed but hadn’t yet been named) that were decorated with fanciful cartoons. The sidelight made it into print and eventually they became popular but in his long lifetime he was Mr. Lear, the landscape painter. His origins were not such that you would imagine him as a ten year old boy as someone who would travel much of the world, tutor Queen Victoria in drawing and painting, and be friend of the landed and political elite and the age’s cultural elite (Tennyson, Wilkie Collins, Audubon, Ruskin, among many others). He came from the large, large family of a businessman who was fortunate in his early days, before Edward, one of the youngest of the family was born, and very unfortunate thereafter, going bankrupt, spending time in debtor’s prison, and working hand to mouth thereafter. Young Lear was raised by his much older sisters, already young women when he was a toddler, and had a non-existent relationship with his mother. But he had a loving one with his sisters who taught him to draw and write and shared his skill and love of games of wit and rhyme. He had little formal schooling and the little he had scarred him in ways he would allude to but never discuss. He also had possible instances of abuse from (likely) two male family members, a cousin and perhaps a brother (C.). He suffered severely from epileptic fits, which at a young age he learned to “manage” by going into hiding for the duration as soon as he sensed one coming on. As a boy he began earning a living as an artist, making signs with illustrations for local shopkeepers. He was diligent, a patient and insistent observer, and a lifelong walker. Through hustle he got access to the London zoo, began drawing the animals there, particularly the parrots, and parlayed that into his first career success, one that led to connections to England’s upper class that through word of mouth and weekend stays led to more connections. Two other things led to further connections with young men of family—his travel and his homosexuality. While going on sketching walks he met folks or had them accompany him and met other folks. His sketching tours of England, Scotland, Italy and Germany expanded his circle of potential patrons and friends. On one he had an idyllic time with Frank Lushington, a young man from a staid and influential family who seemed quite as whimsical, romantic, and dreamy as the slightly older Lear. They remained friends for life and Frank was the frustrated love of Lear’s life. Later times with Frank were more complicated. In England he found Frank just as staid and formal as his family. Still Lear pined and hoped up until Frank married and had children. Then he was the great family friend and godfather to several of his children. He also had a thirty year relationship with his travel servant that Uglow doesn’t explicitly say was partially romantic but might well have been. The servant, Giorgio, is buried in the same cemetery, with identical headstones, to Lear, side-by-side. There were also several women he considered marrying, including a woman named Gussie to whom he nearly proposed multiple times and after each shying away was melancholy with regret. The great female love of his life was likely his friend Alfred Tennyson’s wife. He preferred her to her husband (and her husband’s poetry to the man, who was moody and self-important) but was life-long friends with both. From all this—impoverished start, inadequate training in art, gender uncertainty, chronic illness and restless journeying—he managed an impressive life very much on his terms, living abroad or traveling in fall and winter, returning to England in summer to visit family and friends and supervise book publications and sale of his art, never working in an office or business but on projects of interest to himself. Still, there was the melancholy and the failure to strike up a permanent, open, intimate relationship. Mr Lear by Jenny Uglow. It is difficult to say much more than this is the best book that I have read this year. 5 stars. Stumbled across this on the New Books shelf at one of my public library's branches while there for a meeting. I knew next to nothing about Edward Lear, certainly not as an artist. Such an excellent example of biography! Uglow traces Lear's life, mostly chronologically, from his middle-class upbringing in London fraught with family economic misfortunes and rather distant parents, to his life as a traveling artist and writer. Best known for his nonsense poetry (The Owl and the Pussycat) and limeric Stumbled across this on the New Books shelf at one of my public library's branches while there for a meeting. I knew next to nothing about Edward Lear, certainly not as an artist. Such an excellent example of biography! Uglow traces Lear's life, mostly chronologically, from his middle-class upbringing in London fraught with family economic misfortunes and rather distant parents, to his life as a traveling artist and writer. Best known for his nonsense poetry (The Owl and the Pussycat) and limericks, he was also an accomplished if not very widely embraced artist. Although he got his start making finely details botanical and zoological pieces, he gradually moved toward landscapes. And to find them, he traveled widely and almost constantly, across Italy, Greece, Albania, the Middle East and India. His landscapes are strangely dreamlike, and I was quite taken with them. 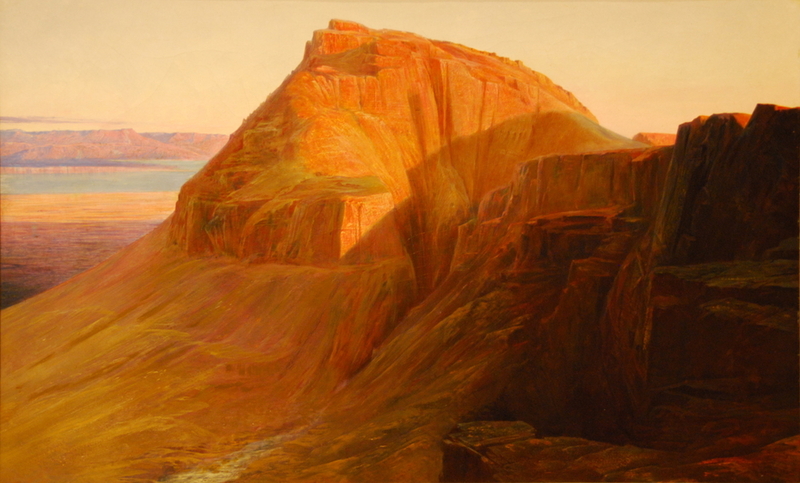 I especially liked his painting of Masada. But in addition to his art and poetry, he had a wide circle of famous friends and acquiantances, with whom he kept up a voluminous correspondence. He was good friends with Tennyson and spent some time giving Queen Victoria drawing lessons. During the latter part of his life he settled in San Remo, Italy, drawing, writing and visiting. Uglow uses the artists output - his drawings, poems and nonsense limericks - to illustrate Lear's passions and many insecurities. He clearly loved many of the men he traveled and corresponded with, but was a man of his time and had no idea how to handle these thoughts and feelings - I think. Many of his most personal letters to friends no longer exist. And although he was dearly loved by his friends, it seems that he was a poor promoter of his own art and writing, and much of his output seemed to have been purchased in an effort to prop him up. Mr Lear is a beautiful and lavishly presented book. The hard cover is stunning with a picture of one of Lear’s parrots and the title “Mr Lear” in gold. The pages of the book contain many colour plates of Lear’s art together with reproductions of his letters and cartoons. Jenny Uglow has written a magnificent detailed and comprehensive biography of Edward Lear drawing on his correspondence with his vast network of friends, relations and patrons. Uglow tells us of his friendships with Lord Derby, t Mr Lear is a beautiful and lavishly presented book. 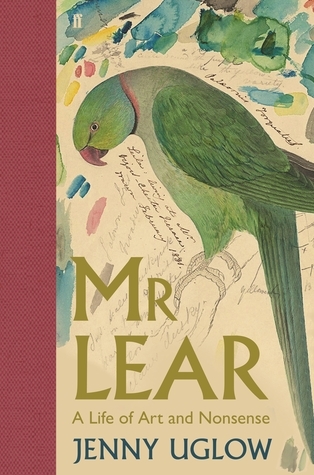 The hard cover is stunning with a picture of one of Lear’s parrots and the title “Mr Lear” in gold. The pages of the book contain many colour plates of Lear’s art together with reproductions of his letters and cartoons. Jenny Uglow has written a magnificent detailed and comprehensive biography of Edward Lear drawing on his correspondence with his vast network of friends, relations and patrons. Uglow tells us of his friendships with Lord Derby, the pre- Raphaelite artists, romantic poets and of course Tennyson and his family. Until I read Mr Lear I only knew of Lear’s nonsense poems which are well represented in the book. In Mr Lear we also learn about Edward Lear the artist and travel writer and the beautiful pictures he painted whilst in places such as Greece, Italy and India reproduced in the book. By the end of the book I felt as though I had come to know one of the most interesting characters of the Victorian age. Uglow tell us in the book of several occasions when he struggled to get his work published. If he was alive now I am sure he would be well pleased with the publication of this panorama of his life and work. A sad and lovely biography, with a couple of side characters (his manservant Giorgio and his friend and sometime sweetheart Gussie) whose lives could be O'Henry stories in and of themselves. Lear is best known for his brilliant nonsense such as "The Owl and the Pussycat" but his life as a gay man in Victorian England seems to have been lonely and frustrating. Like so many beloved creators, his life, is his own eyes, was not quite fulfilling. The biography isn't perfectly paced -- six hundred pag A sad and lovely biography, with a couple of side characters (his manservant Giorgio and his friend and sometime sweetheart Gussie) whose lives could be O'Henry stories in and of themselves. Lear is best known for his brilliant nonsense such as "The Owl and the Pussycat" but his life as a gay man in Victorian England seems to have been lonely and frustrating. Like so many beloved creators, his life, is his own eyes, was not quite fulfilling. i loved this book. It is printed on very good paper and has wonderful reproductions of his paintings. I had no idea he was so good as a landscape painter, let alone that he gave lessons to Queen Victoria. I was caught up in the nonsense and the fun cartoons as well. Really a very enjoyable read. What a prodigious output Lear made in his lifetime of creating thousands of artworks: drawings, paintings, etchings; and writing poems, songs, and all manner of nonsense. He also wrote dozens of letters a day. As a young boy, his parents left him in the care of his kind oldest sister, Anne, because they were too occupied with the other dozen or so surviving children of their brood. However, their finances were rocky, so young Edward learned to make his living in his teens, working for Gould, a ta What a prodigious output Lear made in his lifetime of creating thousands of artworks: drawings, paintings, etchings; and writing poems, songs, and all manner of nonsense. He also wrote dozens of letters a day. As a young boy, his parents left him in the care of his kind oldest sister, Anne, because they were too occupied with the other dozen or so surviving children of their brood. However, their finances were rocky, so young Edward learned to make his living in his teens, working for Gould, a taxidermist, documenting the animals in the London zoo with his accurate drawings, and later, private menageries. Early on Lear found patrons among the richer classes he worked for, enabling him to travel and develop his art painting landscapes. He studied with the pre-Raphaelites, fell in love with Italy whose climate was kinder to him, and whose manners were easier going than those in England with its damps and Victorian restrictions on what was done and what was not. Throughout his life, Lear had many friends, and one serious love, who because he was a man, never could become the intimate companion he craved. However, his charm and ability to amuse children resulted in the nonsense verse for which he is known and loved. His most constant companion was Giorgio, his servant. Giorgio carried his materials where they went, and they went to some challenging albeit gorgeous places including Palestine, the Nile, India during monsoons, the Himalayas. Wherever he traveled he created faithful paintings depicting the locations. He wrote books for fellow travelers, hoping to earn money from their sales. One of the themes of the book is how Lear was constantly grubbing for money. Sometimes his patrons grew tired of it. Lear lived during a time of social upheaval and political revolutions but remained not neutral exactly, more distanced as an artist. Considering how extremely social he was, his disciplined practice yielded lots of gorgeous pictures, full of the awe of an Englishman in the midst of foreign beauty. He was under the influence of Turner, and for poetry, Tennyson, whose wife became a faithful correspondent. I confess I prefer his pictures of parrots and animals. His book of parrots he sold by subscription . It was in the era of Audubon who was doing the same thing with his American birds, and who was a subscriber of Lear's Parrots. This is by far the best biography I have ever read, and considering I have read many, that is high praise. I had read Levi's biography many years ago and I hardly remember anything, it left such a weak impression. What I do remember is finding it a boring book and being a bit disappointed, considering how much I love Lear. Uglow's writing, by contrast, is like reading a good novel—e.g. you keep on hoping Lear will marry Gussie even though you know he won't in the end. Uglow brings Lear to life a This is by far the best biography I have ever read, and considering I have read many, that is high praise. I had read Levi's biography many years ago and I hardly remember anything, it left such a weak impression. What I do remember is finding it a boring book and being a bit disappointed, considering how much I love Lear. Uglow's writing, by contrast, is like reading a good novel—e.g. you keep on hoping Lear will marry Gussie even though you know he won't in the end. Uglow brings Lear to life as an individual, while also providing insight into his art & creative process—both for his landscape painting as well as his nonsense. Her fascinating portrayal is not just of the protagonist, but the many interesting friends and acquaintances he had. She also vividly portrays the era & brings alive its artistic & cultural trends. I learned quite a bit not just about Lear and his art, but of the historical artistic milieu which influenced him. I read this on a whim, after reading a short review in the New Yorker. My interest wasn’t intense but it is a well-written and absorbing study. What tickled my interest was that although he is best known today for his nonsense books, his main claim to fame in his own time was as a superb landscape painter and travel writer. You get a strong, sometimes intimate sense of him throughout the book. Enjoyable. Jenny Uglow really does have the knack of producing fascinating comprehensive readable biographies! This is a beautifully illustrated and produced account of Lear's life - I was aware of him as a nonsense poet so the big eye opener for me was his career as an artist from the observational work with birds and animals to landscapes in Europe and beyond. Excellent treatment of an artist more renown for his limericks than his paintings. A bit slow going as Lear tries to settle on a career and a home. The strange and sad life of a man who repressed his sexuality and wandered through much of Europe, Middle East and India, painting and drawing everything. I enjoyed learning about life in Edwardian-Victorian England. This is the most beautiful book I have read for a long time, which certainly does justice to the work of the subject, wonderfully reproduced. But it is very heavy... Meticulously researched, Jenny Uglow also infuses the text with her own enthusiasm for Lear, producing an excellent and sympathetic portrait. Highly recommended to fans of Lear and anyone who relishes fine biography. Fantastic read, interesting, informative and enlightening. Lots of factoids and detail on the nonsense writers life who did more than The Owl and the Pussycat and the prose this is written allows the layperson to find out about all this extra ever easier. A beautifully produced book, which is a pleasure to read. The information from thorough research is thoughtfully processed so that the work is well structured with appropriate illustrations and examples. Lear's art work and writing are interpreted in conjunction with other evidence to make a whole picture. I mostly knew Lear as the writer of nonsense and was delighted to learn about his life as an artist and traveler. This wasn't my favorite biography, but I did enjoy it overall. Perfect in winter for an anglophile who has lots of free time. Beautifully illustrated, old school enjoyable. Jennifer Sheila Uglow OBE (née Crowther, born 1947) is a British biographer, critic and publisher. The editorial director of Chatto & Windus, she has written critically acclaimed biographies of Elizabeth Gaskell, William Hogarth, Thomas Bewick and the Lunar Society, among others, and has also compiled a women's biographical dictionary.